The school season as begun and by now everyone should be in a routine. Right? I know our little Caleb has started preschool and he sure does like it. This card is made with pieces of Graphic 45's new paper pack called An ABC Primer. This pad is just FULL of papers that make me smile. I used two different dies on this card. The first one is from PaperTrey Ink - The Banner Builder Collection I cut three little gingham tales for my paper strips from the largest die in the set. 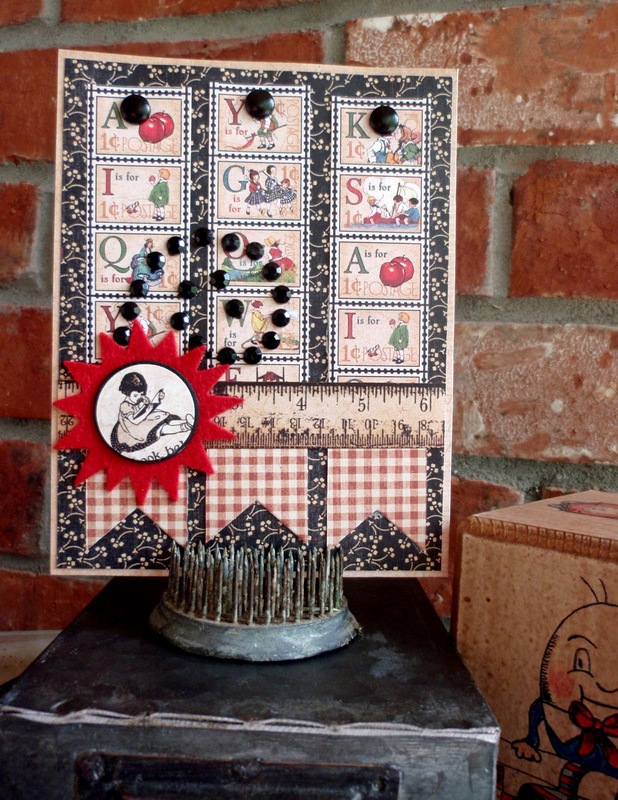 The second die is from MFT Stamps and it is the Sunshine Die. I cut it from red felt and then cut a small picture from the patterned paper. I also cut some chipboard to go under that little picture to pop it up a bit. Just a hint - when you make your own chipboard accents, color the edges with a marker and it makes it look more finished. I used a black Copic on this one. I hope you will run over and look at all her sketches. It is a quick way to ensure you will love your cards because half the work is already done for you. I LOVE sketches! So I will be back tomorrow and I hope to see you then.